Welcome to the latest Stopwatch Gardener podcast, where I take a mid-February walk around the garden. In this episode I’m looking at a creeping phlox, dreaming of meconopsis, and announcing my 2014 Rare Plants for Rare Disease Research fundraiser for neuroacanthocytosis patients. There’s a link to subscribe to this audio podcast at the bottom of this blog, or you can sign up in the margin here to get an e-mail alert whenever I publish a new episode. Thanks to the Visit Massachusetts team for introducing me to the designers at its RHS Chelsea Flower Show 2013 garden, which won a Silver Gilt. 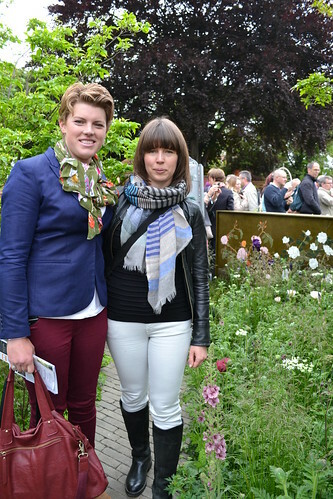 Below is taken from my exclusive chat with artist Susannah Hunter and garden designer Catherine MacDonald. Who are the design team? Susannah Hunter (shown below) and Catherine MacDonald, applique leather artist and landscape designer respectively. I hadn’t realised Susannah is from Arbroath, well north of me in Scotland. Catherine is with Landform Consultants, and Amanda Miller assisted Catherine with the graft of planting on site. What is the Visit Massachusetts Garden? A small garden in the “Fresh” category at RHS Chelsea Flower Show 2013. Panels of Susannah’s botanically correct leather murals line the walls of this intimate space, softly planted by Catherine. A channel of blue leather and waterlillies crosses the plot, covered with perspex (I would have loved to see running water here). I loved this garden – and it photographed so well, with foreground “real plants” like foxgloves against a backdrop of the same flower in leather. Where did Catherine and Susanna get their inspiration? Susannah wanted to pin the garden to some kind of Massachusetts narrative, and a visit to Amherst and the Emily Dickinson museum helped her understand more about the reclusive poet: Dickinson was a keen gardener and flowers feature heavily in her writing. The Houghton Library and Glass Flower Collection at Harvard University were great resources for Susannah, and Dickinson’s own herbarium (a book of labelled, pressed flowers) gave Catherine a plant list to work from. (Catherine r. and Amanda l. are shown together below). When is the garden set – historic or modern? “It’s a modern take on the English cottage garden,” Catherine told me, and I could see that: sleekly shaped chair, trendy deschampsia cespitosa, and did I mention the leather? Actually the deschampsia felt retro, recalling long roadside grasses during my childhood near Boston. 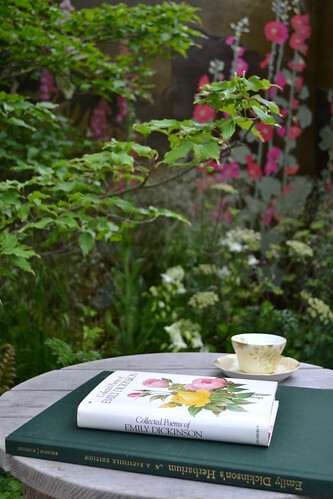 Undeniably the garden feels historic, with the dainty tea cup, old books and old-fashioned hollyhocks tilting lazily across Susannah’s panels. Key plants are aquilegias (aka columbines) Black Barlow, Ruby Port and Vulgaris Alba; cornus kousa Chinensis (sadly the genuine New England flowering dogwood, cornus florida, isn’t easily available in the UK), Iris sibirica Tropic Night, Matteuccia struthiopteris, Papaver Patty’s Plum. Why leather in the garden? Isn’t that crazy and perishable? Susannah’s left some of her applique panels in her own garden as an experiment and they’ve weathered well, but she most definitely hasn’t designed her work to be for outdoors. “It’s about bringing the garden into the house,” Susannah says. 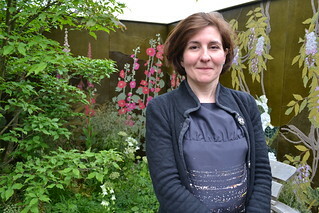 “I have clients I’ve done commissions for – for example one client whose yellow irises only flower for a few weeks of the year – and I’ve done a headboard for her, to see the iris all year round.” Susannah hasn’t designed any pieces meant for the outside, although she says she’s thinking about doing so. How does the artist work? Susannah sketches flowers from life – her wisteria panel began as a drawing of a friend’s abundant wisteria one May – and also works from photographs, building up an image bank to draw upon for commissions. Plant geeks will love the accurate detail and growing habit of her work: climbing roses reach horizontally across panels, wisteria spills down the wall, tall hollyhocks lean just a bit to one side. You can see Susannah’s work here, contact Catherine via Landform Consultants and go visit Massachusetts for goodness sake: there are now garden tours to the region. If you enjoyed this, you can click below to share on Facebook or Twitter. This species crocus has not minded the cold March weather at all. You can just see the purple colour at the throat of the flower, which I expect to open up in the next few days, snow or no snow. Another white crocus I planted — I think it was Ard Schenk – has suffered badly from slugs. I sat by one of them the other day and watched as it was warmed by the sun and promptly fell over, having been nibbled at the base. I love the delicacy of Prins Claus – I’ll try to share a picture soon of a pot of them growing on my steps, if springtime ever springs and they open up. 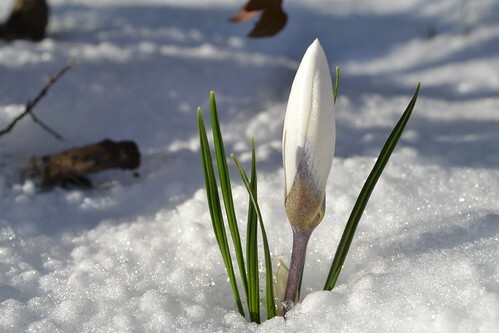 What crocus or other early flowers are pleasing you at the moment? For six years I’ve been trying to identify this sophisticated double daffodil with the shredded, egg yolk-yellow centre. I found it growing just outside the walled garden of my mother-in-law’s house in Mull, off the west coast of Scotland. The helpful David Wong of Plantedd has suggested it looks something like Narcissus “Glowing Phoenix,” and it may well be, but I’m going to have another look when it flowers this year and compare it against the Phoenix pictures. My mystery bulb also resembles Narcissus Eystettensis, which has the same shredded centre but is one colour throughout. I like to imagine a romantic past for this unique flower: maybe it joined the other spring flowering bulbs that I know this Scottish garden used to provide to the ancient abbey on the island of Iona, about an hour away. I’m really keen to identify this flower for my mother-in-law. If you are (or know) a narcissus connoisseur or other bulb expert, I’d be grateful for your help.